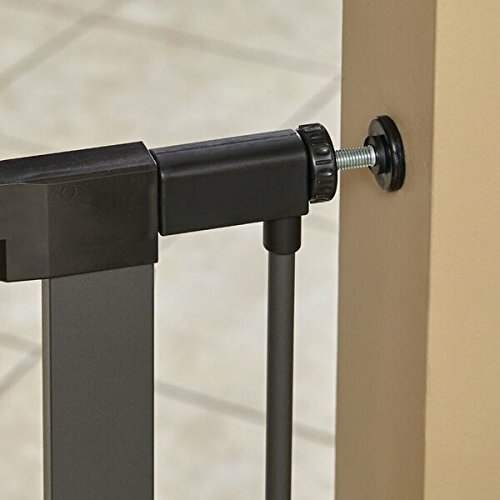 The Steel Pet Gate by MidWest Homes for Pets is a convenient way to partition off rooms from your pets to keep them safe and out of harm's way. 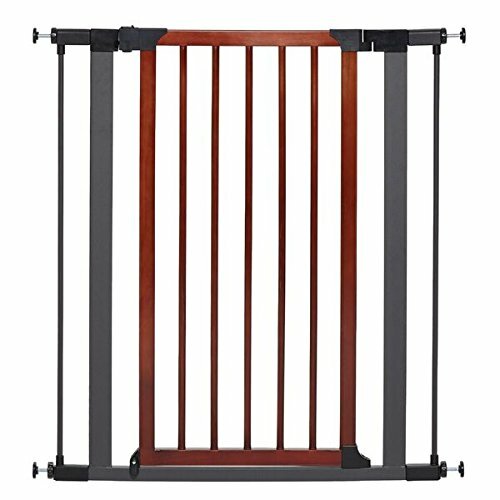 The strong safety gate's design is made of tubular steel and the textured graphite frame / wood door compliments any home décor. 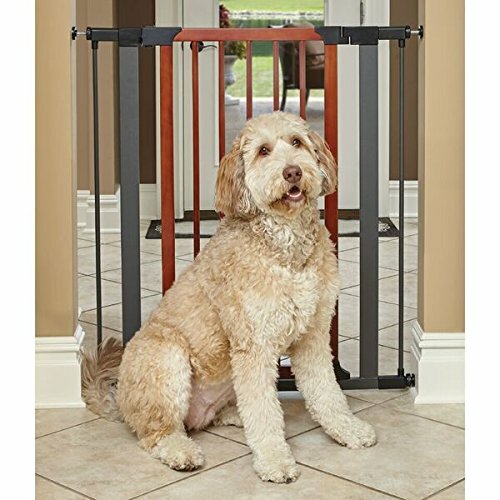 This pet gate (model # 2939SG-WD) measures 39.125 inches tall & expands from 29.5 - 38 inches wide to accommodate most doorways or stairwells. The pet gate door measures 19 inches wide with 2.375-inch spacing between the vertical bars. The walk-through door's convenient one-handed design allows you to easily open the gate while carrying groceries, etc... The "lift & open" operation securely keeps the dog gate closed and your pet contained in the desired location of your home. 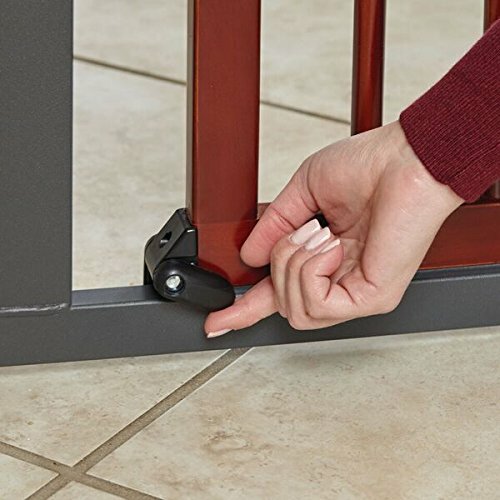 This pet gate includes an auxiliary lock on the base of the door allowing you to change the directional swing of the door providing additional security / convenience to the pet gate. 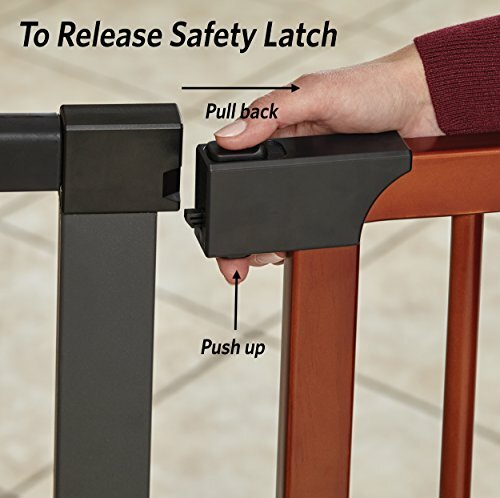 Each pet safety gate comes with 4 "wall safe" easy-to-set pressure mounts, two additional 3-inch extensions (equaling a total width of 38 inches) and a tightening tool to securely assemble the pet gate in your doorway. Additional pet safety gate extensions 3, 6 or 11 inch are available for purchase. We only suggest using 1 set of gate extensions per gate to ensure a firm / sturdy assembly. Have the peace of mind that your dog or other pet is securely contained where you left them with a pet gate from MidWest Homes for Pets. 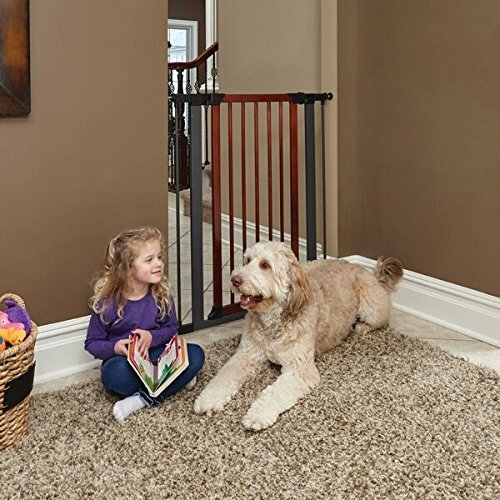 We understand that your pet is a part of your family and that's why we ensure our safety pet gates are manufactured with the highest quality control standards. MidWest Homes for Pets stands behind the quality of our products with a 1 Year Manufacturer's Warranty. If you have any questions about our steel pet gates our customer service department would be glad to help you. MidWest customer service can be contacted at: 1-800-428-8560, available 9:00 AM - 4:00 PM, Monday - Friday. If you have any questions about this product by MidWest Homes for Pets, contact us by completing and submitting the form below. If you are looking for a specif part number, please include it with your message.